How to get there: This peak is located in the far interior of Troms, near the border to Sweden. It is one of the most remotely located peaks in Norway having a primary factor exceeding 1000 meter (one peak in Finnmark is also quite remote). A natural trailhead is near the dam at the north-west end of lake Altevatn. From Tromsø, drive south on Hwy. E8, then E6 to the village of Setermoen. This is 161 kilometer. 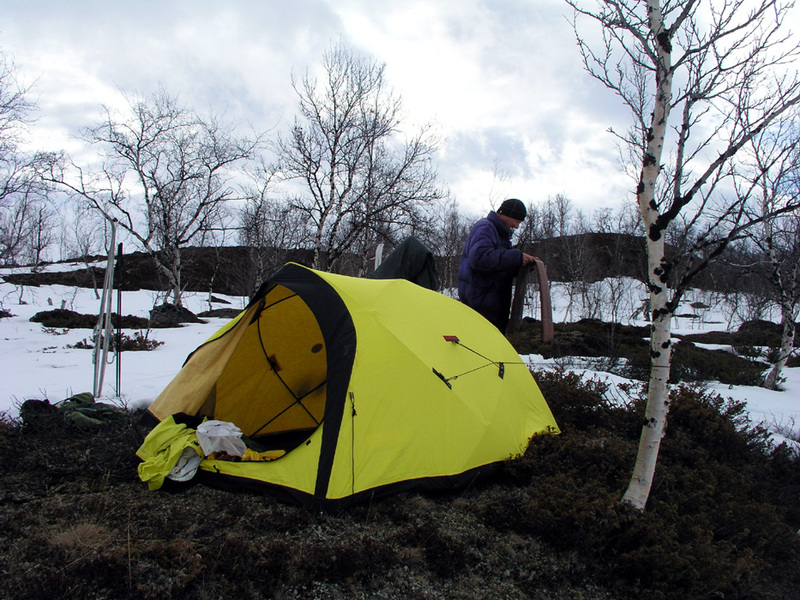 Leave E6 in Setermoen, turn left and follow signs to Altevatn. This is 35 kilometer from Setermoen. There is a large parking area quite close to the Altevatn dam. This is the trailhead, location north 68:39.554, east 018:52.988, elevation about 500 meter. Note: The entire parking area near Altevatn is pay parking, the local enforcement has established a pretty stupid system where the parking ticket machine is located several kilometer down the valley at Innset. Any visitor will think that these machines serve the local parking area at Innset and that the Altevatn parking will have its own service. To add insult to injury, these machines do not accept credit card payments, only coins. The charge in 2005 was 30 NOK per day, so a three day trip would require that you bring NOK 90 in coins. 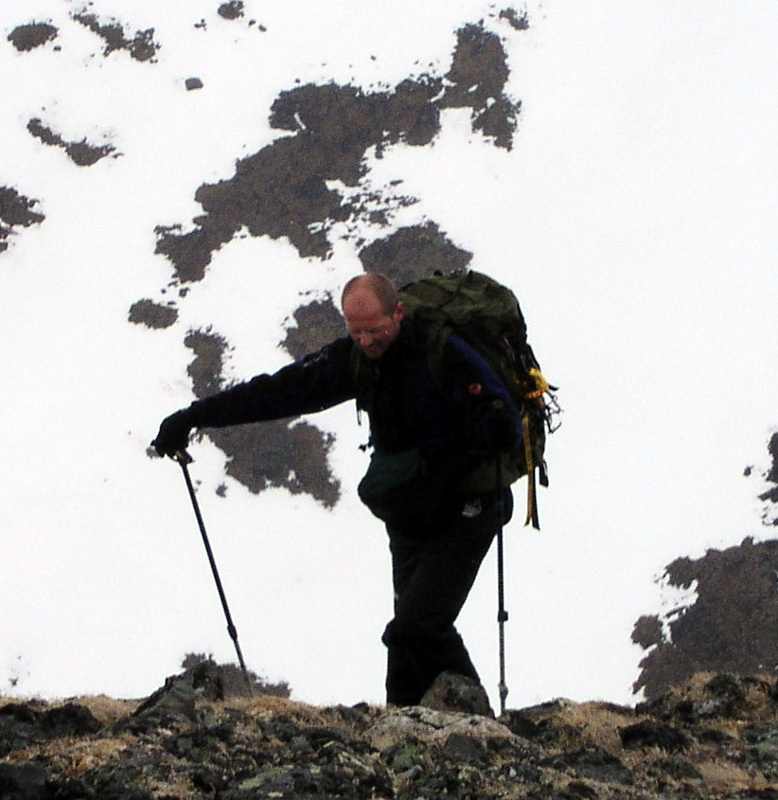 First, approach hike: Cross the dam, then ski (or hike) along the south side of lake Altevatn. Generally, stay higher than the power line that runs along the lake. The terrain higher up is easier with less trees and one avoids a constant hike with the terrain slope going across the route. After about 10 kilometer, the course can be set more south as one leaves the Altevatn lake and heads into the valley Stordalen. In winter, it pays to ski across the lakes in this valley, there is an old "gamme" (traditional hut) at location north 68:34.152, east 019:11.524, elevation 582 meter. This hut is in need of repair, but may serve as a reasonable waypoint in order to continue with full advantage of the lakes. A base camp for climbing the mountain is located between the two lakes that are both listed at elevation 544 meter on the map. A characteristic penisula separates the lakes and there is a good place to camp on the mountain side (west side) of the small water passage here. This is about 25 kilometer from the trailhead, depending a bit on the conditions this may require anything between a half and a full day to cover. The precise location is north 68:31.611, east 019:17.153, elevation 547 meter. Second, peak climb: From the above base camp, head directly up the hillside and climb the ridge on the south side of the creek that comes from lake 854. This is easy terrain. Cross the creek just below the lake and continue up the ridge above you. This ridge is quite nice and provides easy access to higher ground. The route continues along this ridge until reaching 1600 meter of elevation. At this point, head directly north for one kilometer, pay attention to the cliffs on the east side by staying below the ridgeline. Complete the climb by curving a bit more to the right as you ascend the final slope to the summit. The cairn is located near the cliffs, the last stretch being virtually flat. 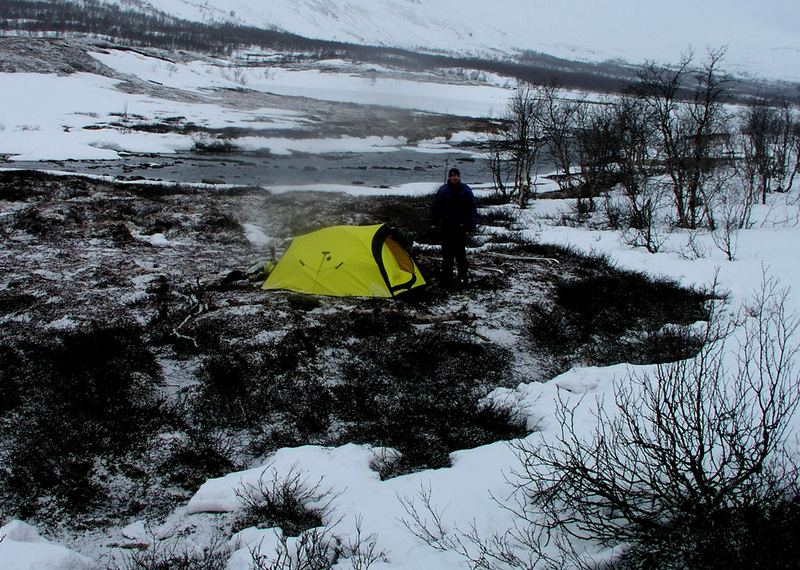 Comments: I carried out this "mini-expedition" with my friend Ståle Grimen. After a successful climb of Blåtindan in the morning, we headed to Altevatn in order to complete as much as possible of the approach that day. After some initial trouble with the stupid local parking scheme (we had to buy coins from a friendly person, then return down the valley to buy a ticket), we finally started out at 1800. 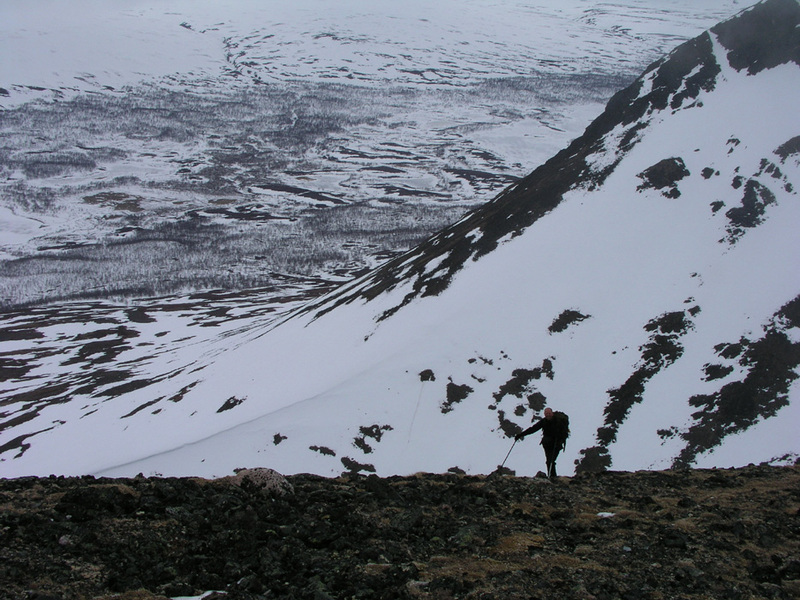 The initial skiing was somewhat difficult, we were too low on the sideways sloping hill and the crust was quite hard. Later, the conditions improved and the terrain is really special, large meadows, sparse birch forest, a distinct feeling of heading into quite remote wilderness. We skied until 2130 and had then moved about 16 kilometer (as the crow flies) from the trailhead. We had reached location: north 68:34.970, east 019:11.278, elevation 531 meter. We felt that we had made good progress, the mountain could be seen among the clouds, we were definitely on the way into Stordalen. 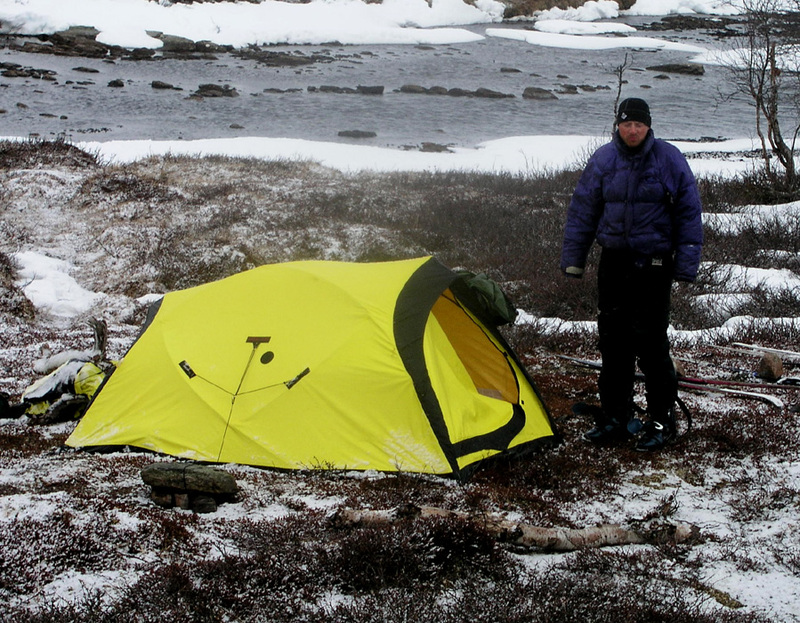 We set up camp next to a small creek, had dinner and went to sleep soon thereafter. The next day, we continued skiing at 0800 and reached the base camp area at 1030. After establishing camp and resting, we set out for the summit at 1200. Somewhat to our surprise, the ridge extending up and into the clouds was free of snow. We could only ski to about 680 meter, then continue on foot. 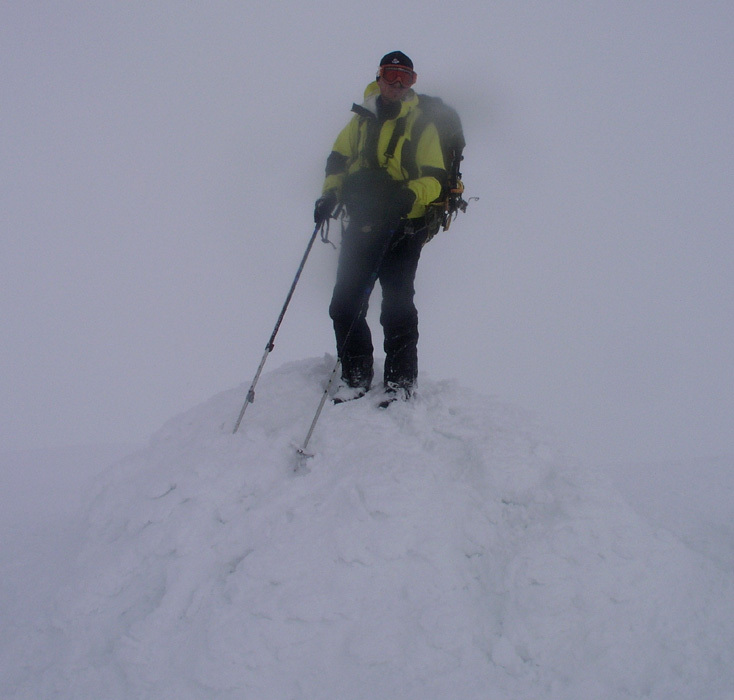 We completed the climb in quite dense fog (clouds) with very limited visibility, arriving at the summit cairn around 1600. Just as we arrived, the sun started breaking a bit in the clouds and visibility improved temporarily. However, never to the extent that we really could enjoy any views to the surronding terrain. Soon, the clouds again engulfed us as we headed back down the same way we had ascended. Below the clouds, we could see across and into Sweden, however clouds prevented us from seeing the high peaks also there. We were back at BC at 1800 for a well deserved dinner. The next morning came with a mix of snow and rain. It would indeed have been nice to launch an attack on the high prominence peak Salmmecohkat, 1610 meter with primary factor as high as 1051 meter. This peak was certainly within range for a day trip from our current camp. However, the weather was pretty miserable and any attempt on that peak would almost certainly be another "skiing in the dense fog" type of experience. Ståle felt like returning to civilization and hopefully improved weather. I could not but agree that this made most sense and we decided to ski back to the car at the Altevatn parking. I do know that this Swedish peak may be at least as difficult should I ever return to climb it, access from Sweden does not seem any simpler, with its location north of the enormous lake Tornetrask. We started skiing at 0800, the crust was weaker due to the recent mild weather and rain. We therefore experienced more breaking through the crust than we appreciated, but still returned to the car at 1445, pretty tired and definitely looking forward to a well deserved dinner. This was peak number 5 in my T5 trip. Next peak Leirtinden. Previous peak Blåtindan. Camp I, on the way to Rohkunborri. What happened to the snow? 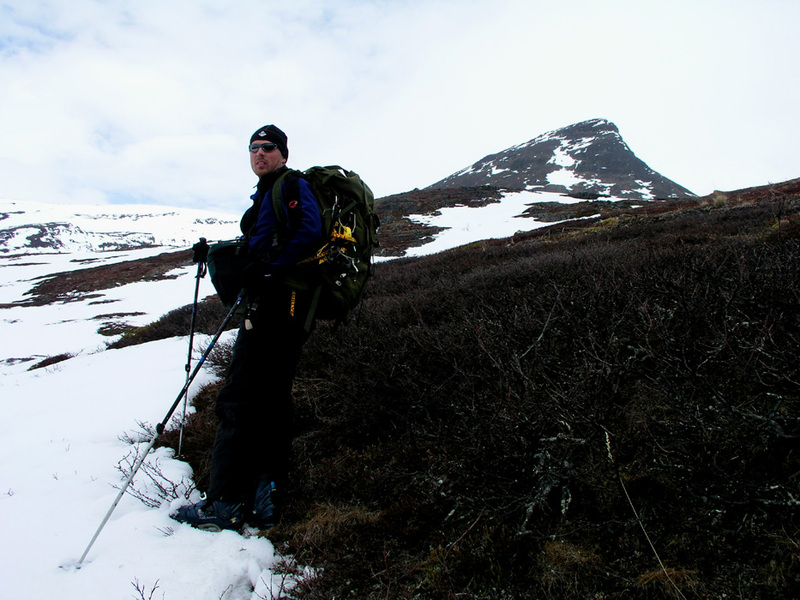 We leave the skis and climb Rohkunborri on foot. 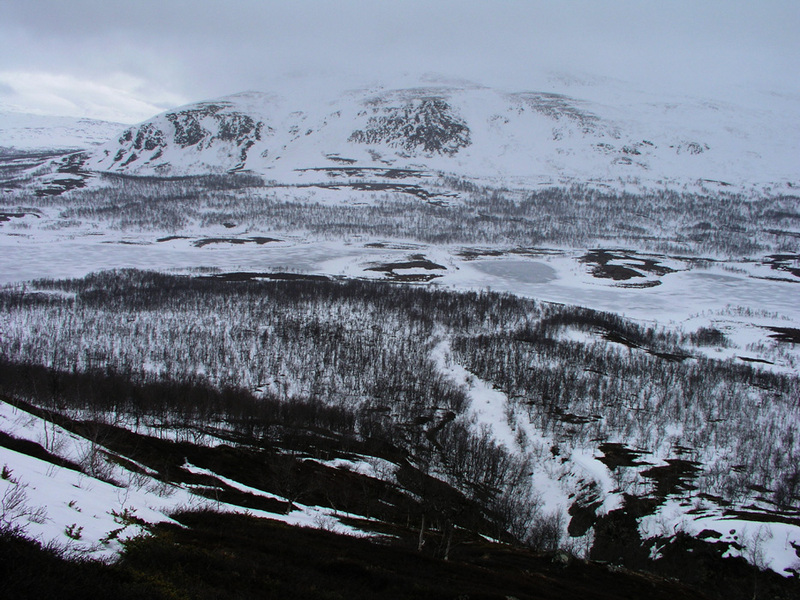 View back down, true arctic wilderness. Ståle ascending, the lower part of the ridge. Arriving at a small plateau. On top of the Rohkunborri cairn. The next morning, Rohkunborri BC. Traditional mountain hut. 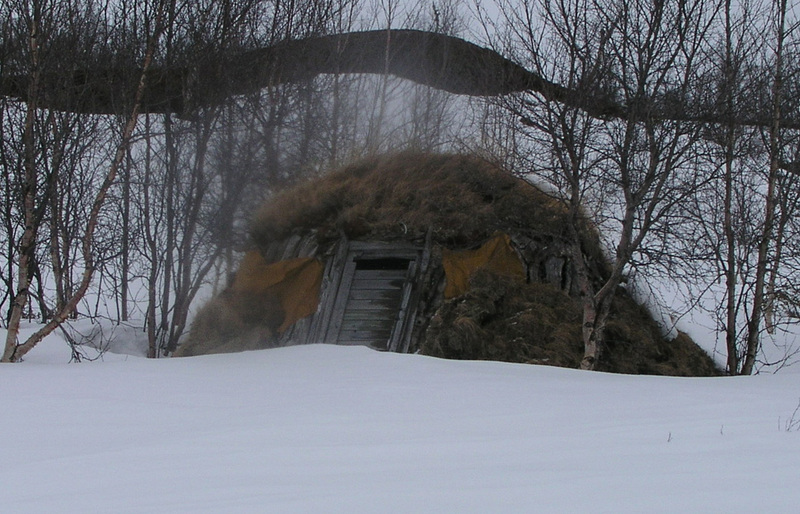 Such a hut is called a "Gamme".